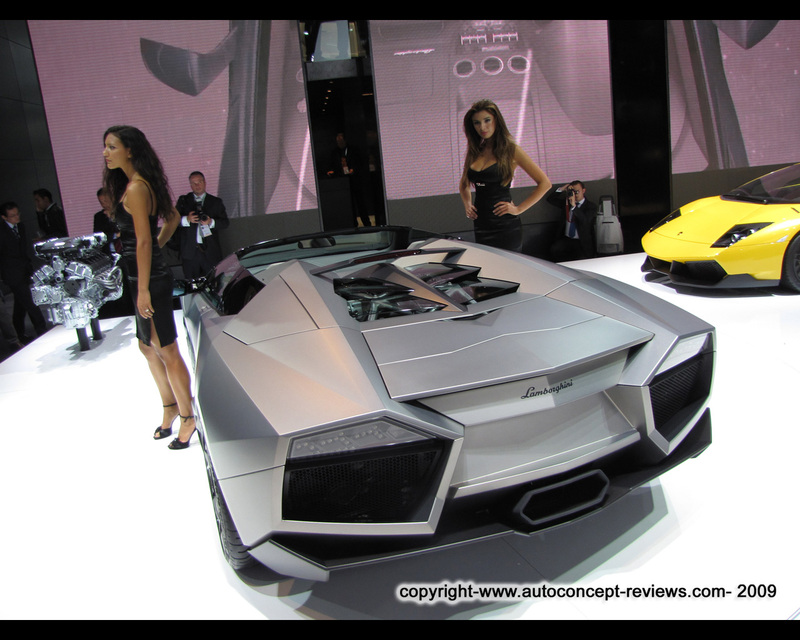 The Lamborghini Reventon Roadster produced in only 20 units is a 1,1 Million Euros (without taxes) fast moving technical sculpture introduced at the 2009 IAA Frankfort Motor Show. " 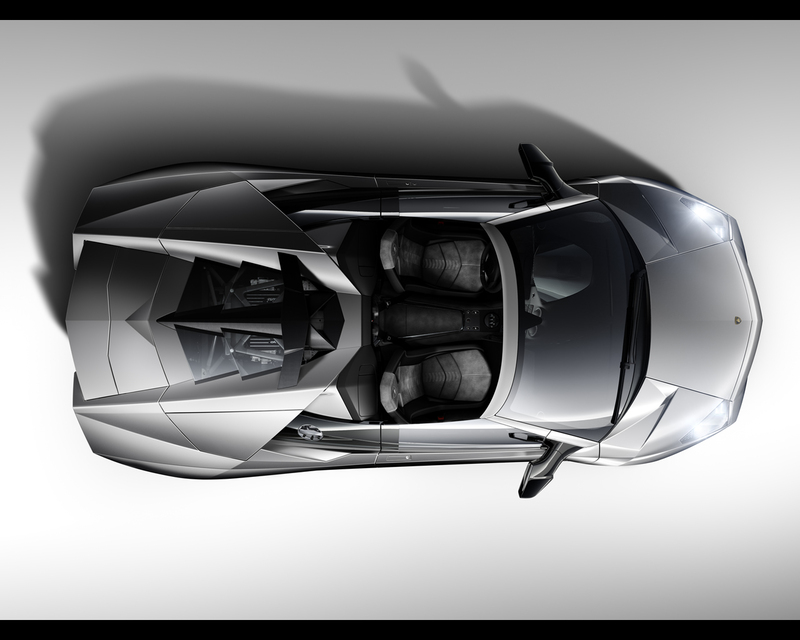 The Reventon is the most extreme car in the history of the brand," comments Stephan Winkelmann, President and CEO of Automobili Lamborghini S.p.A. " The new roadster adds an emotional component to our combined technological expertise - it unites superior performance with the sensual fascination of open-top driving." 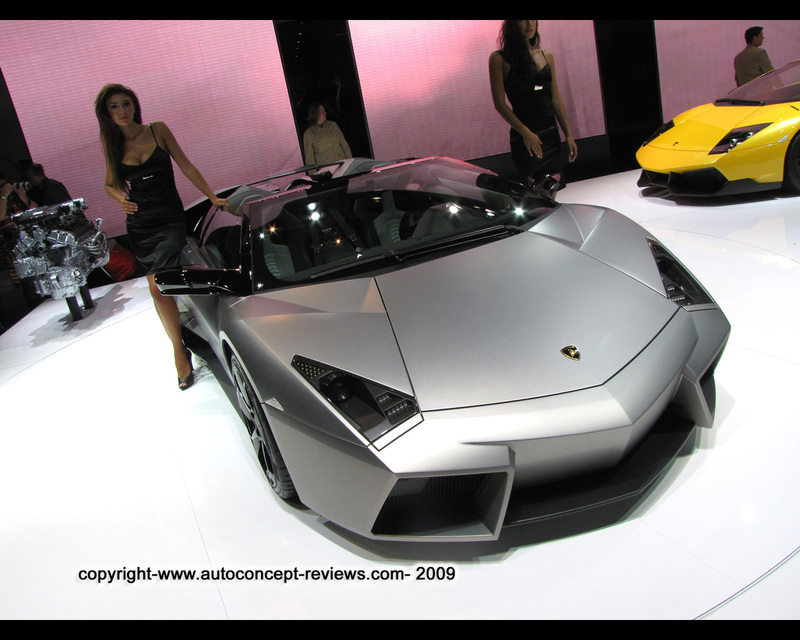 The Reventon Coupé was presented at the 2007 IAA in Frankfort and was sold out immediately. 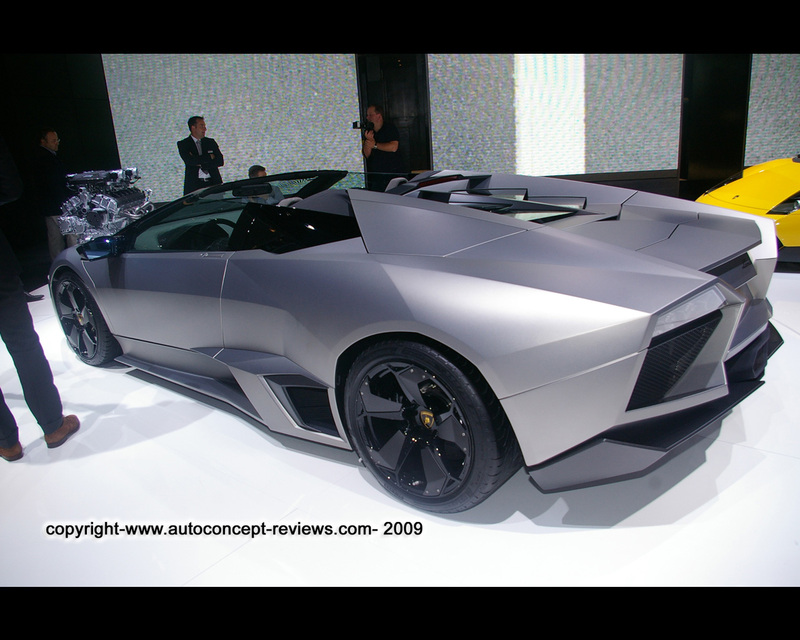 See Car Reviews - Lamborghini Reventon 2007 for further details and pictures. The 6,5 litre twelve cylinder generates 493 kW/670 hp at 8.000 rpm, catapulting the Roadster from 0 to 100 kph ( 0 to 62 mph) in 3,4 seconds and onwards to a top speed of 330 kph (205 mph). 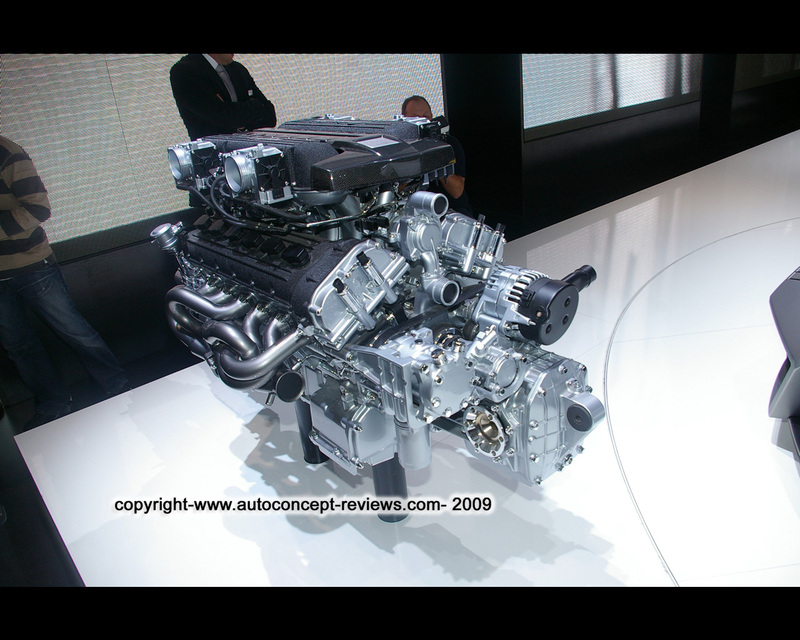 It is one of the world's most powerful naturally-aspirated engines. With a compression ratio of 11:1 and a displacement of 6.496 cc (396,41 cubic inches) its maximum torque is announced for 660 Nm (487 lb-ft) at 6.000 rpm. The V12 is a masterpiece of Italian engineering. Two chains drive its four camshafts that, in turn, operate the 48 valves. Together with the three-phase adjustable intake manifold, the variable valve timing delivers a meaty torque build-up. Dry sump lubrication ensures that the power unit has a constant supply of oil, even during heavy lateral acceleration. The dry sump lubrication allows a low mounting position, benefiting outstanding handling characteristics. Braking is by ceramic disc brakes. In classic Lamborghini style, the aluminium engine is mounted longitudinally in front of the rear axle, with the automated six-speed sequential manual transmission ahead of the engine beneath the center tunnel. The transmission is activated hydraulically via two steering wheel paddles. This layout results in 58 per cent of the overall weight being born by the rear wheels. This layout accommodates the Viscous Traction permanent all-wheel drive. Under normal conditions, it sends the vast majority of the driving force to the rear wheels. Should they begin to spin, the central viscous coupling sends up to 35 per cent of the power via an additional shaft to the front axle. Limited-slip differential are located there and at the rear axle with 25 and 45 per cent lock respectively. 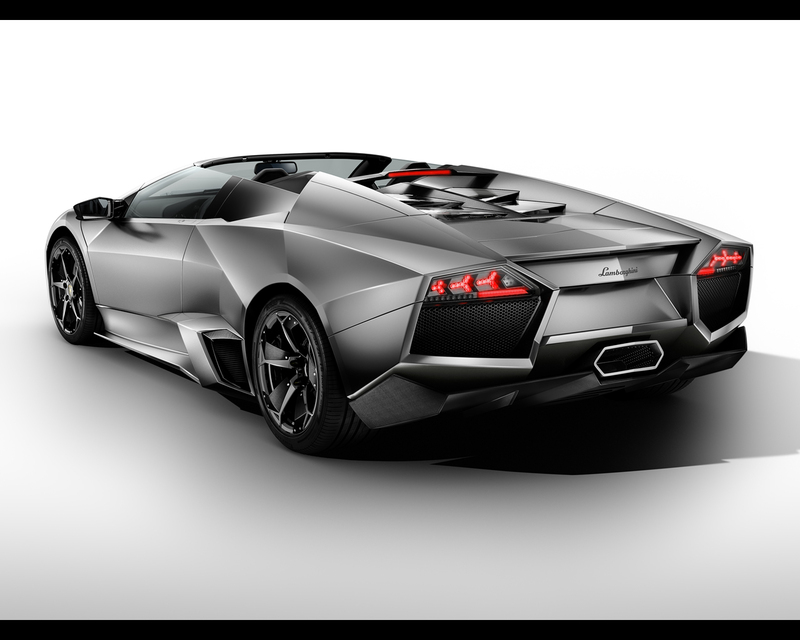 The Reventon Roadster is derived from the same creative thinking as the Coupé. Its designers found their inspiration in aviation - the aggressive wedge shape evokes images of fighter jets. The powerful arrowhead form at the front, the mighty air intakes pulled way forward, the broad side skirts, the upwards opening scissor doors and the rear end with its menacing edges - the Roadster is clad in a design of maximum functionality and spectacular clarity. Details set stylish accents, such as headlamps featuring bi-xenon units with LEDs forming the daytime running lights and indicators. The rear lamps are also equipped with LEDs. Like the Coupé, the Reventon Roadster measures 4.700 mm (185 in.) long. It has a wheelbase of 2.665 mm (105 in.) and is 2.058 mm (81 in.) wide and 1.132 mm (45 in.) high. The driver and passenger seating positions are low and separated by a substantial central tunnel. Behind the two seats are two hidden pop-up bars that deploy upwards in just a few hundredth of a second in the event of an imminent rollover. A fixed, horizontal wing-shaped member behind the seats bear the third brake light. The design of the Roadster's long back is also quite distinct from that of the Coupé. The engine bonnet is virtually horizontal and a total of four windows made from glass provide a view of the mighty V12 in all its technical elegance. 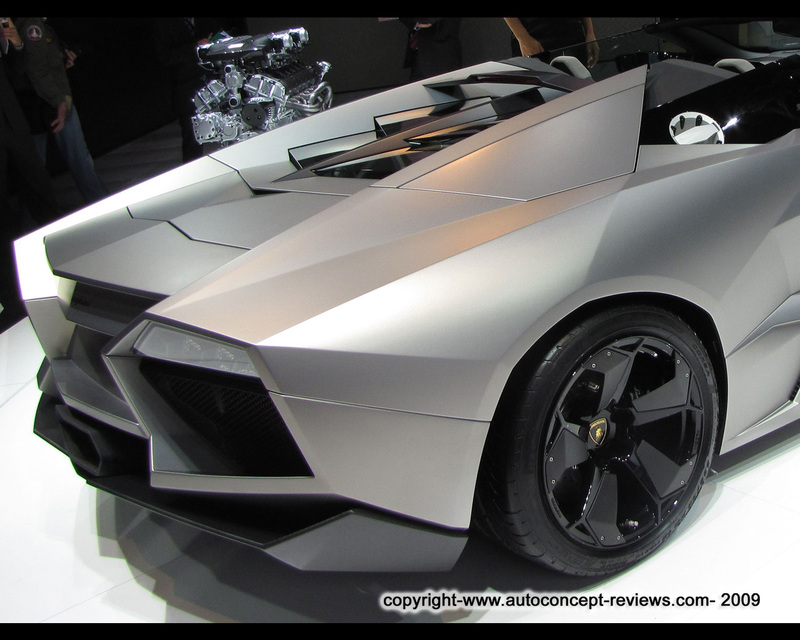 The base bodyshell of the Reventon is already so stiff that the Roadster requires only minimal reinforcement. It has a dry weight of only 1690 kg (3.725 lbs. ), just 25 kg (55 lbs.) more than the Coupé. Like the Coupé, the cell of the Roadster is made from high-strength steel profile and carbon components joined with specialist adhesive and rivets. The bodyshell is made almost entirely from carbon fibre elements, with sheet steel used only for the outer door skins. 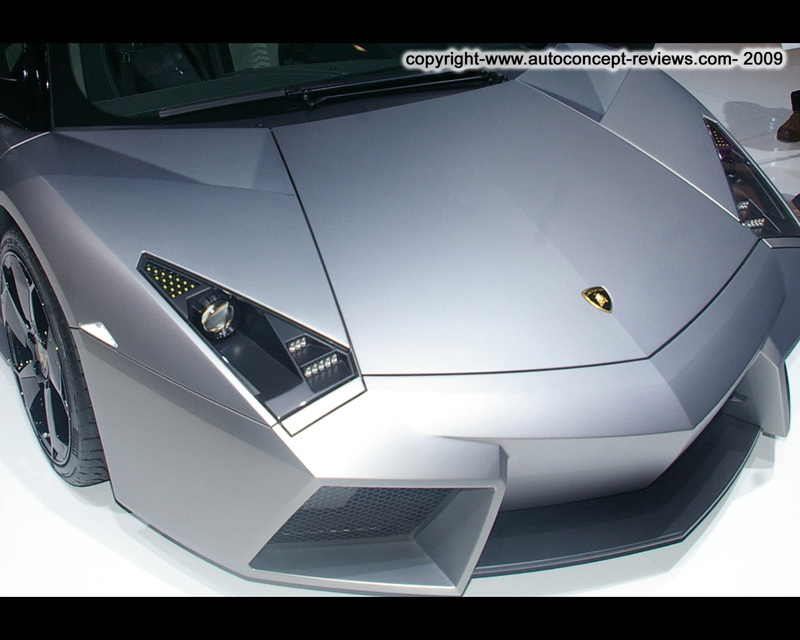 A unique paint finish completes the razor sharp design language of the Lamborghini Reventon Roadster. 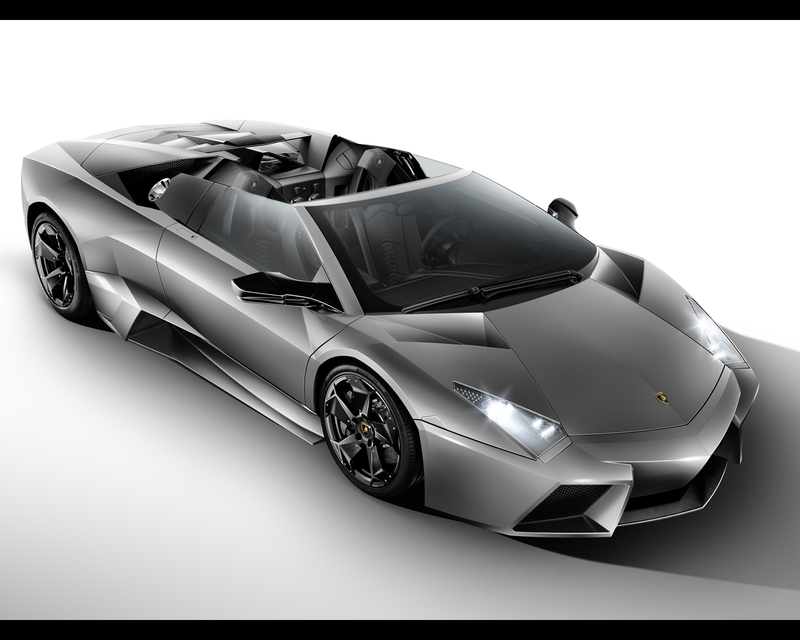 For this exclusive special edition, designers have created a new of matt grey called Reventon Grey. As for the Reventon Coupé, which is slightly different shade of grey, this is a matt paint finish that, in the sunlight, displays an unexpected impression of depth thanks to its special metal particles. 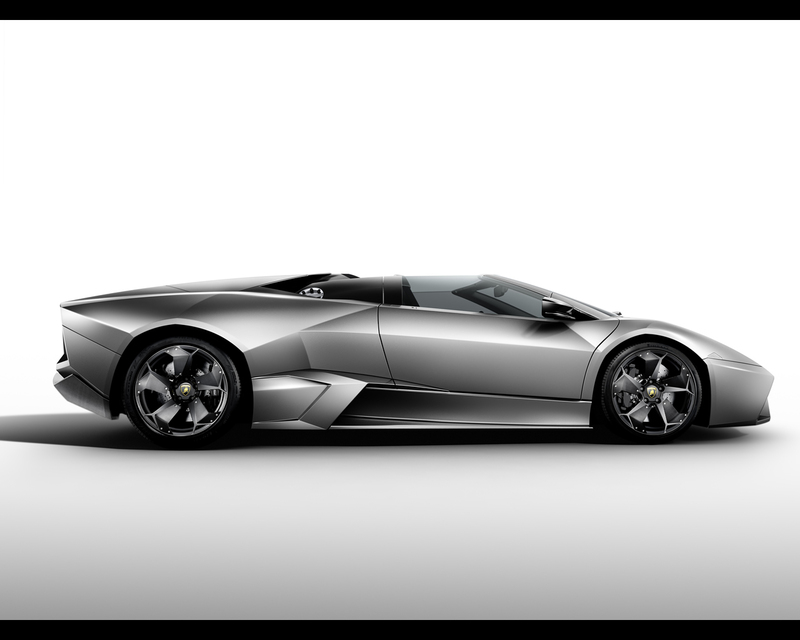 The wheels of the Reventon Roadster also incorporate the interplay of matt and glossy elements. A further dictinctive characteristic of the Reventon Roadster is its calm directional stability even at extremely high speeds, to to its high performance aerodynamics. Alongside the bodyshell design and smooth underbody, which culminates in a powerfully formed diffuser, the rear spoiler deploys from the rear edge at about 130 kph ( 80 mph) and adopts an even steeper angle as about 220 kph (136 mph) for further down force. 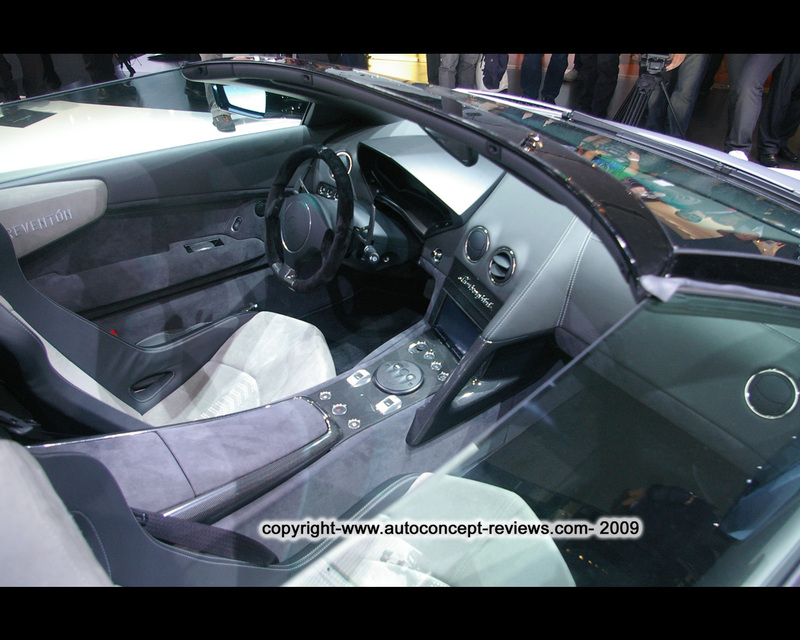 The interior of the Reventon Roadster conveys the same powerful design as the exterior. The cockpit is structured with technical clarity, the interfaces arranged for functionality. Like a modern aircraft, the open two seater no longer has classic analogue instrumentation- instead, information is delivered via two transreflective and one transmissive liquid-crystal displays. The instruments are mounted in a casing machined from solid aluminium which is housed in a carbon fibre dashboard.